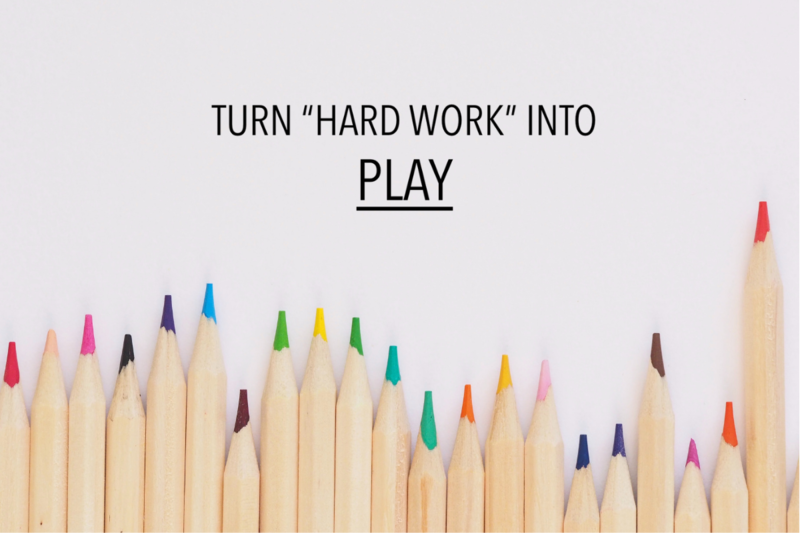 Lately I’ve been experimenting with how to turn “hard work” into “play” as a way to accelerate growth (my version of *super learning*) and also as a way to feel better about, well… everything. These experiments came from two insights. The second insight was one I had about gamification: Billions are spent annually on making us feel like we’re playing a game when we engage with technology, especially our smartphones. That’s why it’s so hard to put the darn things down …from the red dots to the pings to the little number notifications, they’re designed to keep us coming back. This all had me thinking: Where can I “gamify” my life for the results I want? And, well, that got me creating a whole host of practices I now teach in my workshops or 1:1 training. And I want to share a couple with you here. These practices have allowed me to pick guitar back up in record time, easily learn more language skills, and even embody more of the values I want to stand for in my life. They work! Why this works: Our brains are Q&A machines. One of the brain’s primary functions is to search for answers to the questions we ask — kinda like a google search engine, only infinitely more powerful. The problem is that 1) most of us aren’t aware of the questions we’re asking, and 2) we’re asking questions we don’t want answered. In other words, we’re searching for what we don’t want to find! This is why the simple question shift above is a great way to start enjoying what you know you have to do, rather than feeling like it’s an insurmountable task. Those two sets of questions feel very different in our bodies. That’s because our bodies actually respond differently to them. The first creates a tightening, a shortening of the breath, and hence limits our ability to engage creatively. The second activates the mind-body centers responsible for finding imaginative solutions and taking action. PRACTICE N2: Give yourself a score at the end of the day. Why this works: For her birthday this year, my daughter received a mini game console that only has ‘vintage’ games like Mario Bros and Tetris. When she plays, what do you think she cares most about? Her score! The satisfaction centers in our brains light up when we receive the input that we’re improving! Then, when the day is over, I rate myself with this simple scoring system: 0 (neutral or no progress), +1 (showed up for the challenge), +2 (killed it today!). This kind of scoring means I can end up with a neutral score (zero, which never happens when I’m ‘playing’) or as high as +10 (okay, I do cheat and give myself even more points from time to time). Now I would really love to know: What’s YOUR #1 recommendation for turning work into PLAY? Join me in a conversation below! This is a great way to go about things.! Your daughter is on to something! May that curiosity never stop.